eBay shut down approximately 237 auctions for Cranberries rarities when they suspected that their seller, Danny Kronstrom, may have engaged in shill bidding. We told you last week that Kronstrom, one of the biggest Cranberries collectors in the world, had decided to auction his entire collection. By Saturday night, eBay closed all of his auctions and suspended his account. The goodies up for auction included a French “Hollywood” radio promo, a Brazilian “I’m Still Remembering” radio promo, countless European live bootleg CDs, and some promos that we’ve never even seen before. Shill bidding is the process of creating a fake ID to bid on your own auctions in order to artificially raise the prices. A user with the ID of “patheticsenses” was found to be bidding on 117 of Kronstrom’s auctions. “Patheticsenses” had no previous eBay history, was created at the same time as Kronstrom’s account, and was bidding exclusively on Kronstrom’s auctions, but only to outbid other users and never as the first bid. These are all telltale signs of shill bidding. (Even your humble webmaster was outbid by “patheticsenses.”) While Kronstrom’s seller account (“dannykronstrom”) was suspended, the account “patheticsenses” was not. Zombieguide estimates that Kronstrom must still pay at least $60 in lost eBay listing fees for the closed auctions. Thanks to Paul for keeping an eye on this situation for us. The exclusive “Ritz London Magazine” has finally published their long- promised interview with Dolores O’Riordan in their Winter/Spring 2004 issue. This is the first interview with Dolores published since The Cranberries announced their “temporary hiatus” in September of this year. The article covers 5 pages in “Ritz”, making it the most comprehensive interview that Dolores has done in 2003. 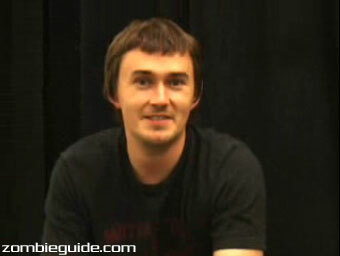 The interview was done this past July with Hot Press editor Stuart Clark. Hotpress.com published excerpts from the same interview over the summer, although none of the quotes from that article are repeated in the “Ritz” printed article. Dolores also talks about living in Toronto, where she has been living for the past several months to record her debut solo album, and she says, where she will continue to live this winter. “Having two rugrats — well, three, including Don [Dolores’s stepson] who’s a big kid – it’s still a magical time of year. We’re going to be in Toronto, which means a lot of running around in the snow and hot whickies afterwards. There are bears in the woods near us, but they’ll be hibernating. God, I can’t wait!” she says in the interview, evoking images of a Canadian Winter Wonderland. 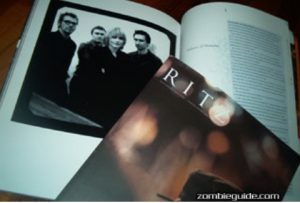 Zombieguide has an extra copy of Ritz available for auction on eBay. We’re also throwing in one of our extra copies of the new book From the Cradle to the Stage by Alan Swan. This is the last interview that we know Dolores to have given, but honestly and unfortunately, it could be the last one we see for awhile. Cherish it while you can. Longtime Cranberries collector Danny Kronstrom has made the hard decision of parting with his collection. Many Cranberries fans, including myself, met Danny through his website,The Cranberries Tape Trader, formerly one of the largest Cranberries websites online. The page that remains there now is but a shadow of its former self. Danny has spent the last several years amassing one of the largest Cranberries memorabilia collections in the world. 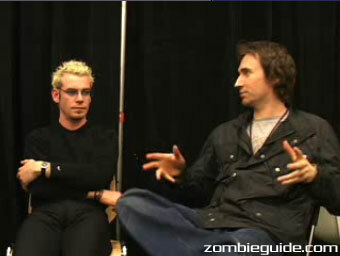 Danny and I have a long history together, as we ran The Cranberries Gazettetogether before I was invited by former webmaster John Armijo to join Zombieguide. 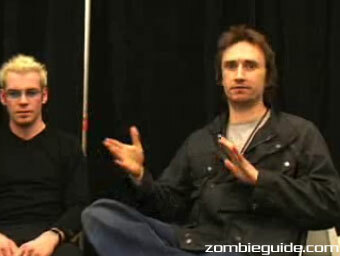 Norbert from over at Zombieguide Europe has dug up an interview with Noel, Mike, and Fergal recorded backstage from this summer’s Rolling Stones Fourty Licks World Tour, where The Cranberries opened for several European dates. 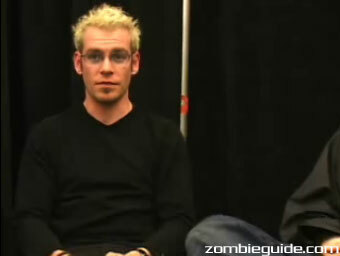 This marks the first, and probably only, video interview of The Cranberries that we’ve seen online in 2003. The video should soon be available in the the ZG Videos Section. Japan is finally getting their hands on the Special Edition 2CD version of “Stars: The Best of 1992-2002,” thanks to Universal Music Japan. Japan initally only received the 1CD version of the greatest hits album when it was released there in September 2002. The new 2CD version will release on January 28, 2004 at a price of 2427 Yen, the same price as the original 1CD version. Universal Music Japan also gave the “Stars” DVD a low-price re- release last month, though no changes were made except new stickers on the outside. No word yet on whether the re-release will contain anything new not included in the international 2CD special edition version. 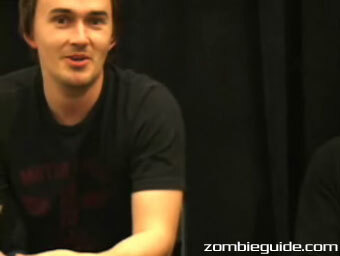 Zombieguide will keep an eye on the new release and let you know if there are any new additions. Patience has always had to be a virtue near and dear to the hearts of Cranberries fans. And now, it appears that it’s time once again to exercise the inspiring (albeit annoying) quality of patience as the January 5th, 2004 release date of Jam & Spoon’s upcoming CD Tripomatic Fairytales 3003 gets postponed. Now, it seems that fans of The Cranberries will have to wait until the vague day in “early 2004” to pick up the Jam & Spoon album that includes “Mirror Lover,” the track that features guest vocals by Dolores O’Riordan. Because no exact date has yet been given to the delayed release, it’s not clear when Tripomatic Fairytales 3003 will finally hit stores. Some people are counting down the days until Christmas. Others are counting down the days until the New Year. 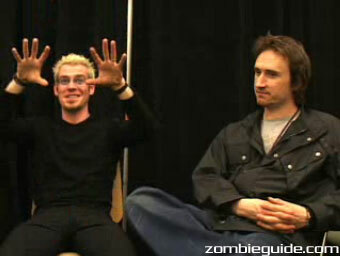 But fans of The Cranberries are counting down the days until January 5, 2004. That’s the scheduled release date of Tripomatic Fairytales 3003, the latest by German trance duo Jam & Spoon that includes the Dolores O’Riordan-vocaled song “Mirror Lover”. And for those close to the music industry, January 5 just got a lot closer. Universal has released a full-length advance album promo disc that includes all twelve album tracks plus three additional bonus tracks. The advance Promo CD (CD: 2003 DE (Polydor / Island / Universal; 51446259) is in circulation now among key industry professionals, but is not sold in stores. Could it be time to go eBay-ing? 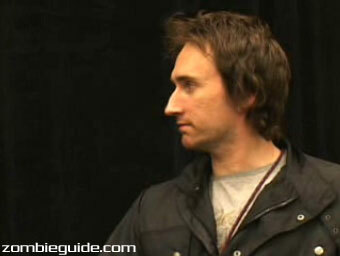 Head over to JamAndSpoon-Fan.de to check out the scans and more info. Even if you have to wait two years before getting a chance to catch The Cranberries live in concert, you don’t have forfeit the thrill of watching The Cranberries live. Thanks to the power of the Internet and a slew of live performances from the past, MTV UK has posted a streaming video performance of “Salvation” live available for download. The only strand of red tape is you’ll need to download RealOne Player and obtain a subscription to RealOne SuperPass…both available now with a limited time free trial period. So logon to MTV UK, power up your pc’s speakers and enjoy.